Crazy Aaron's Sunburst 2" Thinking Putty. In nature, a sunburst is the sudden appearance of the full sun with all its rays from behind the clouds. Any time you need a bit of that happy sunshine feeling, reach for Sunburst Thinking Putty. It starts off as orange sunlight beaming through the clouds and warms to a lemon yellow burst. Sunburst is sure to leave a spring in your step and a smile on your face. Each tin includes 1/5 lb of Sunburst Thinking Putty—a huge handful for tons of fun. Crazy Aaron's Sunburst 4" Thinking Putty. In nature, a sunburst is the sudden appearance of the full sun with all its rays from behind the clouds. Any time you need a bit of that happy sunshine feeling, reach for Sunburst Thinking Putty. It starts off as orange sunlight beaming through the clouds and warms to a lemon yellow burst. Sunburst is sure to leave a spring in your step and a smile on your face. Each tin includes 1/5 lb of Sunburst Thinking Putty—a huge handful for tons of fun. 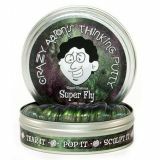 Crazy Aaron's Super Fly 2" Thinking Putty. Musca Domestica (commonly known as a housefly) has thousands of individual visual receptors called ommatidia. These receptors create what is known as a compound eye, which is capable of an almost 360-degree view and incredibly speedy sight. Named for the creature with the fastest vision in the world, Super Fly Thinking Putty will put your eyes to the test! Shimmering tones of metallic green and black give way to gray and silver, just like the body of a common fly. But look again and you'll see tones of peach, mauve, and pink refracting off of its pearly sheen. Each tin includes 1/5 lb of Super Fly Thinking Putty—a huge handful for tons of fun. Crazy Aaron's Super Fly 4" Thinking Putty. Musca Domestica (commonly known as a housefly) has thousands of individual visual receptors called ommatidia. These receptors create what is known as a compound eye, which is capable of an almost 360-degree view and incredibly speedy sight. Named for the creature with the fastest vision in the world, Super Fly Thinking Putty will put your eyes to the test! Shimmering tones of metallic green and black give way to gray and silver, just like the body of a common fly. But look again and you'll see tones of peach, mauve, and pink refracting off of its pearly sheen. Each tin includes 1/5 lb of Super Fly Thinking Putty—a huge handful for tons of fun. Crazy Aaron's Super Lava 2" Thinking Putty. When geothermal energy heats rock deep within the Earth, the molten result is called lava. Lava takes many forms, but the most well known erupts from a volcano or fissure in the surface of a planet. The color of lava depends on its temperature and will shift shades as it cools. Bright orange gives way to crimson copper. A dark, brownish red fades to black as the lava shifts from a liquid to solid. Experience this amazing color shift for yourself with Super Lava Thinking Putty. Each tin includes 1/5 lb of Super Lava Thinking Putty—a huge handful for tons of fun. 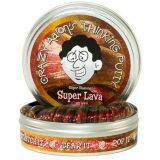 Crazy Aaron's Super Lava 4" Thinking Putty. When geothermal energy heats rock deep within the Earth, the molten result is called lava. Lava takes many forms, but the most well known erupts from a volcano or fissure in the surface of a planet. The color of lava depends on its temperature and will shift shades as it cools. Bright orange gives way to crimson copper. A dark, brownish red fades to black as the lava shifts from a liquid to solid. Experience this amazing color shift for yourself with Super Lava Thinking Putty. Each tin includes 1/5 lb of Super Lava Thinking Putty—a huge handful for tons of fun. Crazy Aaron's Super Oil Slick 2" Thinking Putty. Everyone knows that oil and water do not mix. Yet when they do, what is known as an oil slick appears. An oil slick creates a colorful layer of oil that floats on the surface of water. This layer is highly reflective due to the light wave interference between oil, air, and water. This undulating refractive index makes for shifting colors that move and change with light. You will see the same effect in Super Oil Slick—an extremely popular Thinking Putty color that is downright mesmerizing. Each tin includes 1/5 lb of Super Oil Slick Thinking Putty—a huge handful for tons of fun. Crazy Aaron's Super Oil Slick 4" Thinking Putty. Everyone knows that oil and water do not mix. Yet when they do, what is known as an oil slick appears. An oil slick creates a colorful layer of oil that floats on the surface of water. This layer is highly reflective due to the light wave interference between oil, air, and water. This undulating refractive index makes for shifting colors that move and change with light. You will see the same effect in Super Oil Slick—an extremely popular Thinking Putty color that is downright mesmerizing. Each tin includes 1/5 lb of Super Oil Slick Thinking Putty—a huge handful for tons of fun. 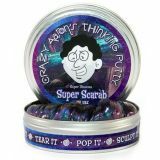 Crazy Aaron's Super Scarap 2" Thinking Putty. The ancient Egyptians were amazed by the scarab beetle. Its beautiful, color-shifting exoskeleton — which mirrors light in tones of purple, blue, red, and copper — appeared magical and beyond the powers of man. Often used in Egyptian art and religion, the scarab symbolized the restoration of life and was used for amulets, talismans, and jewelry. Super Scarab Thinking Putty is a modern interpretation of this colorful icon that's sure to leave you as spellbound as its namesake. Each tin includes 1/5 lb of Super Scarab Thinking Putty—a huge handful for tons of fun. Crazy Aaron's Super Scarap 4" Thinking Putty. The ancient Egyptians were amazed by the scarab beetle. Its beautiful, color-shifting exoskeleton — which mirrors light in tones of purple, blue, red, and copper — appeared magical and beyond the powers of man. Often used in Egyptian art and religion, the scarab symbolized the restoration of life and was used for amulets, talismans, and jewelry. Super Scarab Thinking Putty is a modern interpretation of this colorful icon that's sure to leave you as spellbound as its namesake. Each tin includes 1/5 lb of Super Scarab Thinking Putty—a huge handful for tons of fun. 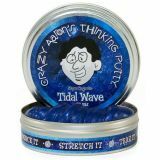 Crazy Aaron's Tidal Wave 4" Thinking Putty. In search of the perfect wave? Try an electromagnetic one. Just like the ocean's tidal forces, electromagnetic forces are incredibly powerful and awe-inspiring. Created to mimic the effect of a giant swell, Tidal Wave Thinking Putty comes with a powerful magnet to help you create incredible effects. Charge the putty with the magnet and watch as the iridescent blue crest moves toward it in an invisible magnetic field. You'll even see ripples on the surface just like the sea. Crazy Aaron's Twilight 2" Thinking Putty. Inspiring songwriters, painters, and poets, the beautiful shades of twilight are also the inspiration behind Twilight Thinking Putty. Twilight is the time of day when the sun sets into dusk. As the sun dips below the horizon, its rays refract and scatter against the atmosphere to shine a bright blue one last time. This putty starts out that same deep purple and turns an almost fluorescent blue to mirror the last flash of evening light. Each tin includes 1/5 lb of Twilight Thinking Putty—a huge handful for tons of fun.